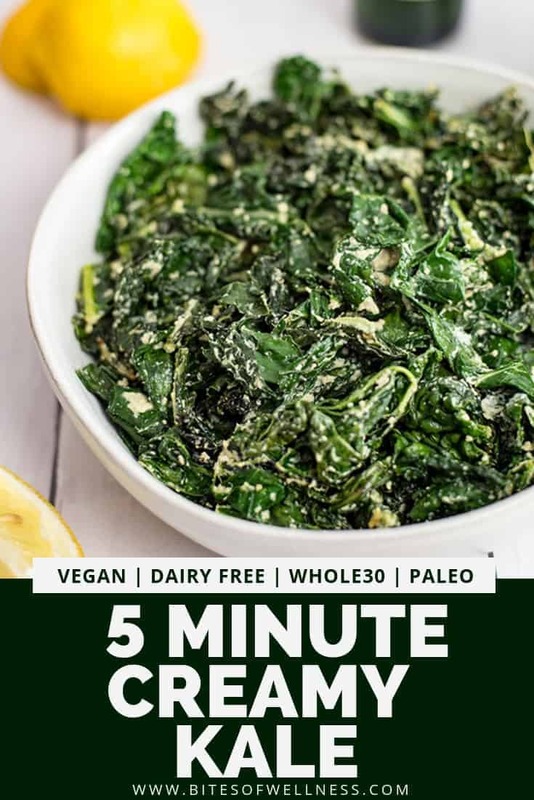 This super simple 5 minute creamy kale is going to easily become one of your go-to side dishes for busy nights! 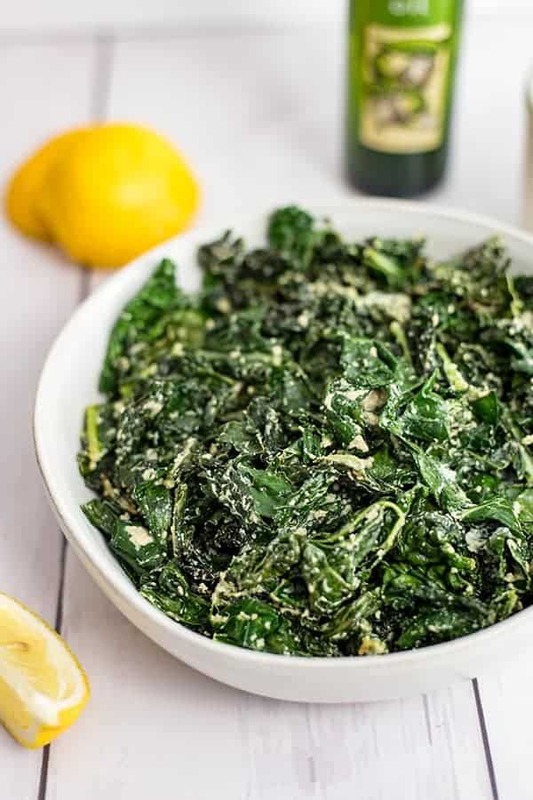 The creamy lemon sauce makes this kale go from boring to exciting without a ton of extra work! Vegan, Whole30, grain free, gluten free, paleo and low carb! I vividly remember when one of my best girlfriends ate a kale salad at work and literally spit it out declaring “it tastes like dirt”. I laughed until I cried that day, because I think we have all been there before! Kale can be bitter and yes, it can even taste like dirt if you don’t treat it right. 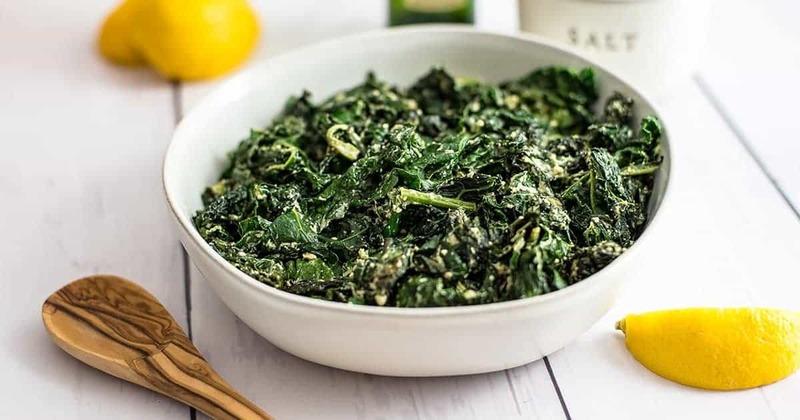 But the good news is that this 5 minute creamy kale dish will make you fall in love with kale (if you aren’t already). One of the things I taught her was that kale needs acid to taste better. 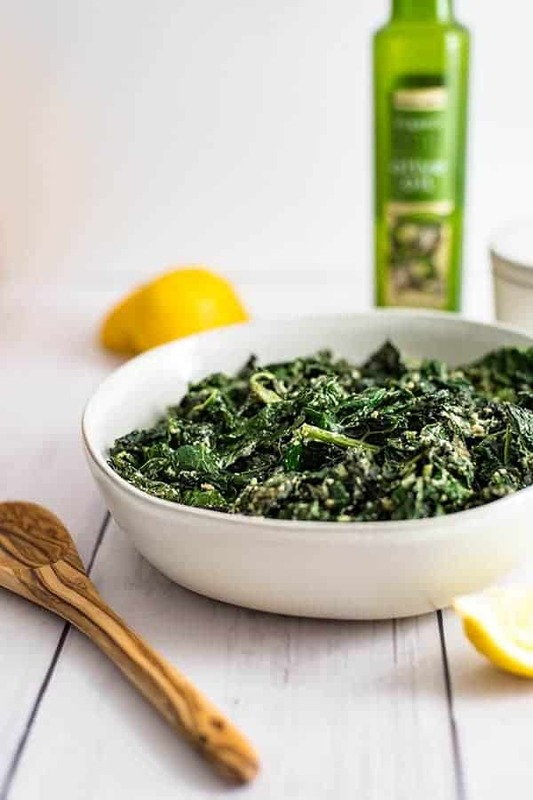 For raw kale salads, it’s best to massage the kale in a little vinegar or lemon juice and olive oil or avocado oil before adding the rest of the ingredients. This starts breaking down the kale and changes the taste and texture so that it’s less earthy and more delicious. Creamy dressings work well too, since the kale can stand up to the weight of the dressing. When cooking kale, the same basic principals are true. Add vinegar or lemon juice to cut through the bitter taste. 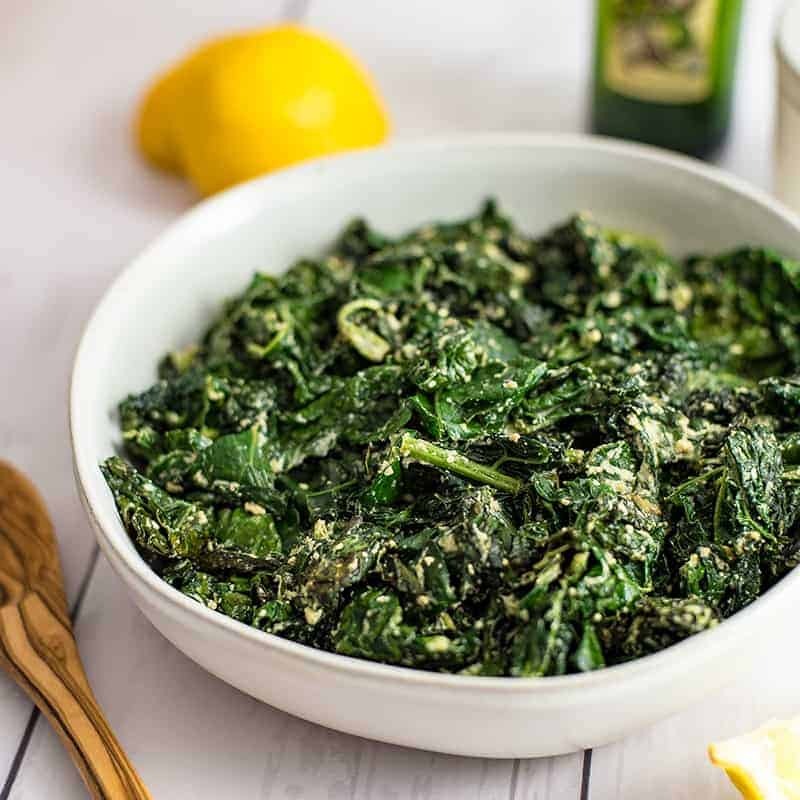 Kale can handle creamy sauces or just a drizzle of olive oil or avocado oil (good fats are important for absorbing those vitamins and minerals)! 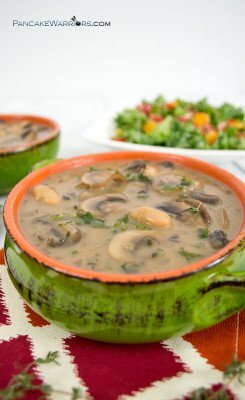 The creamy sauce is my secret weapon to making kale crave-able! The creamy sauce is just a few ingredients and doesn’t require any fancy skills or equipment. 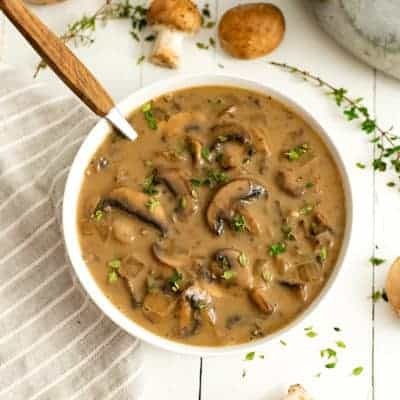 Just combine your favorite nut butter (I used pumpkin seed butter, but almond butter, sunflower seed butter or tahini would be great too), lemon juice, salt, garlic olive oil (affiliate link) (or olive oil and garlic powder) an water in a bowl. Once the kale has sauteed for a few minutes, pour the sauce over the kale, stir well and serve hot! That’s it! 5 minute creamy kale that pairs well with any dish! For this recipe I used dinosaur kale (you may see it called Tuscan Kale). It was on sale at Whole Foods and the leaves were big and beautiful and I couldn’t resist. But most days, I just buy a big bag from Costco or Trader Joe’s all chopped up and ready to go. If you decide to buy a bunch of kale, make sure you rinse it off (sometimes it’s got some sand/dirt on it), and you will want to remove the thick stalk in the center. I do this with my hands, I tear the kale from the stalk by hand, and then quickly rip it into bite size pieces. 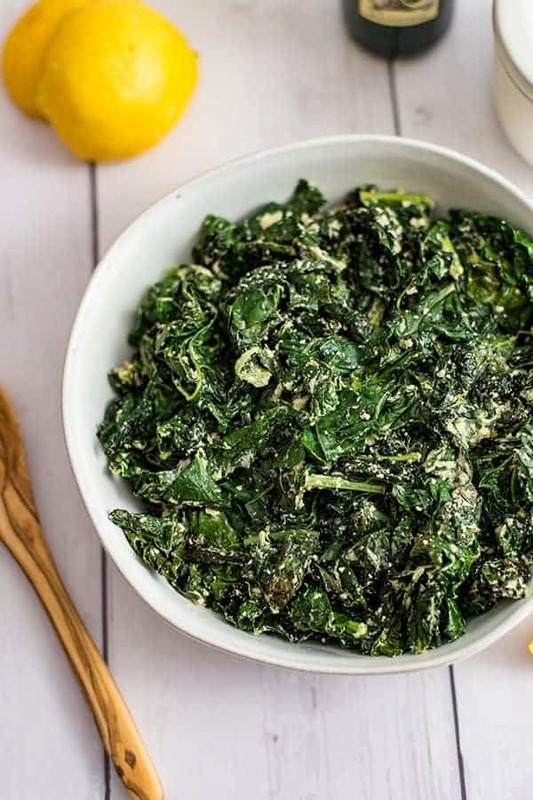 This recipe for 5 minute creamy kale is going to become one of your go-to side dishes for dinner! It's so simple to make and only has a few ingredients! 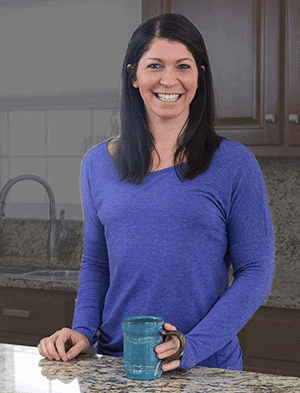 Vegan, Whole30, paleo, gluten free, grain free, low carb and allergy friendly! Add 1/2 tbsp garlic olive oil to the pan. Add the chopped kale to the olive oil and stir well. While the kale is cooking down, make the sauce by combining the rest of the garlic olive oil, nut butter, lemon juice, salt and 2 tbsp of water in a small bowl. Stir well until combined. Never liked Kale until this recipe! Even my picky eaters at the dinner table liked it.